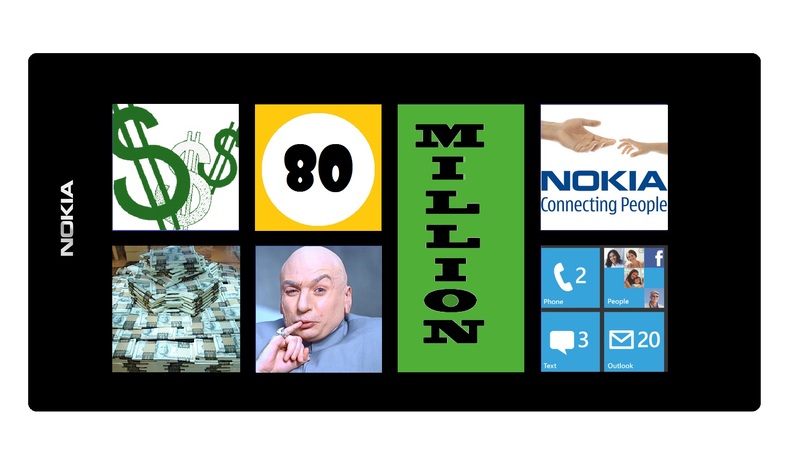 MarketingMagazine via The Next Web are reporting that Nokia are supposedly going to be spending 80 Million dollars British Pounds on a six month ‘brand repositioning campaign’. This is expected to roll out in October, when the first family of Nokia Windows Phones will be launched. Cheers Adnan for the tip. This was meant to be the end of the post but somehow ended up with a rant. 1) No wishy-washy, overly arty vague adverts that mean NOTHING. They MUST be DIRECT. The moment you start going your airy-fairy namby-pamby ways, viewers switch off. d) This phone is available at “place, price, when”. e) Nokia is new, it’s modern, it’s not JUST cheapo brick 3310 with many poor attempts at touch screen and it’s something they want to buy NOW. 4) Someone MUST be speaking in your advert. DON’T just have written keywords (worse, NOTHING at all). 5) Launch day must be epic. See here for some lessons for keynote from dear old Jobs. 6) Give away handsets to your developers, and supporters. Not new, but something you should continue. 7) Make it SUPER EASY for people to know WHERE to buy your products from, WHEN (with a freaking DATE) they will be available and at WHAT price. It’s total shambles the vagueness of how people can get their hands on N9 and where. 8) Be BOLDER. In printed and video adverts. Nokia had SO much opportunity to make many, many bold claims (remember, the N8- Best smartphone camera: FACT), but now competitors have caught up. But that shouldn’t stop you. Just focus on things you do really well. 9) Have some kind of continuing, memorable theme. You might not fit ALL your message in one video SO have a series of them. Not new. Something to continue. You could have done this with your “fact” series. N8 – first to produce a movie. FACT. 10) Use some credible, current, popular celebrity (or series of them). Not entirely necessary if this will eat up your budget. Not all of them, I intended to write something similar in a separate post. What does THIS have to do with phones?? How much air time does the N8 actually get? You have few precious seconds and many others advertising their product. Why waste all that time on something that ISN’T your product? So many moments with N8 Nokia could have just filmed the advert with the N8, done something cool and ended “filmed with N8”. Did we see this? No. This, “success is what you make it” – never been a fan of this campaign. What the HELL is going on in the video? This one’s a cool video imo. It’s definitely viral. But is the attention for the phone? This is good. It is smart, humorous, has a lot of popular internet characters to relate to the target audience. Doesn’t really tell you what it can do, but that’s possibly not required for this handset (where appeal is mostly in the design). Another classic – PETA might have something to say against this now. Point is that it takes advantage of one of the many strengths of the phone – having a camera – showing how it was useful in this scenario to capture something memorable. Very inspirational. Iconic sound track (that sky stole afterwards). Connecting. There’s a problem/requirement these people notes and the N95 solves it. PURE focus on the phone. How to use it so folks walk into a shop and now to touch it, to pinch and zoom it (not a natural thing to do with a phone, but seems natural as folks were TAUGHT this in adverts). People USING the device. EMOTIONAL connection on WHY something as rudimentary and something Nokia’s been doing for ages, is now completely NEW all over again. FAMILY. Happy faces. iPhone. Don’t underestimate what your audience will fall for. This is why smartphones have caught on with an audience that’s not so smart. 80 million can do a lot, but it can also do very little. It’s about getting the most bang for your buck. Effective, special and memorable for all the right reasons. What’s your favourite Nokia advert?